NVR vs DVR – What’s the difference between them? If you are contemplating about getting a video surveillance system, there are actually two types of security systems you can find in the market right now. These are the NVR security systems and the DVR security systems. As you probably know by now, the NVR or network video recorder and the DVR or digital video recorder come in a plethora of features, types and models. Understanding their unique functions and the difference between NVR and DVR (NVR vs DVR) is very important for you to choose the system that best suits your needs, requirements and budget. With the rise of the digital era comes the improvement of video records with more complex and powerful network functions. This is why many people find it rather confusing to differentiate a DVR from an NVR. 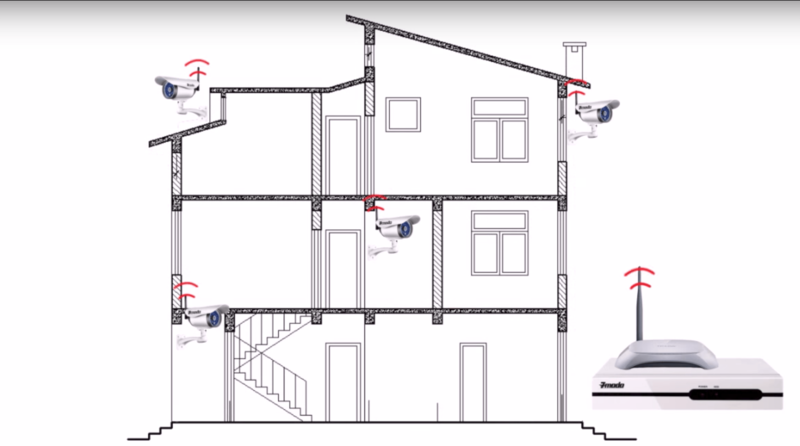 Zmodo put together a helpful video that explains some of the key differences between the two types of surveillance systems. An NVR or network video recorder can record video streaming transmitted through a network cable. IP cameras can connect to an NVR through internet or LAN network. There are instances when, without the use of NVR, end-users can still use IP cameras and installed VMS or video management software to setup their IP surveillance systems. What is the best NVR surveillance camera system? Depending on your use case, we think there are two great NVR camera systems. For home security cameras, we like the Funlux 4 Channel NVR Simplified POE system. The system is easy to set up and offers a few features that are great for home use. It can support up to 180 days of 24/7 HD video monitoring so you don’t have to worry about constantly checking your system’s capacity. The cameras support night vision recording, plus they’re waterproof, which makes them perfect for use indoors or outdoors. For businesses, we recommend the Samsung Wisenet 16 Channel NVR system. When it comes to your business, there are more key areas you’ll want monitoring over – the exterior of your storefront, entrances and exits, each of your cash registers, breakrooms, and any areas where you may be susceptible to theft. This includes the entrance and exits to key areas like restrooms, changing rooms, or remote corners of your store. The Samsung Wisenet system is great because it’s easy to set up, offers super HD recording, and can store 2 terabytes (that’s 2,000 gigabytes!) worth of video. The cameras are waterproof and include night vision. With Samsung’s mobile app, you’ll be able to check in on your employees during the work day, or take a quick peek overnight if your security system goes off. We like the package that comes with 10 cameras include. Because it’s a 16 channel system, you can save money by starting with 10 cameras and expand as necessary over time. A DVR or digital video recorder has a performance similar to a video en-coder which works solely with an analog surveillance camera. This also receives an analog video signal and compresses with H.264 standard and records to an HDD or hard disc drive. Connection between an analog camera and DVR makes use of the coaxial cable. With analog technology seeing rapid developments, there are now a lot of HD analog technologies introduced in the market. The latest HD-CVI and HD-SDI recorders, HD-CVI an HD-SDI DVRs have the ability to record analog videos in high definition resolution which include 1080P and 720P format. What is the best DVR surveillance camera system? For home use, we like the Amcrest 960H 4 Channel DVR system. You can read our full review of the Amcrest system here. The system is great because it’s easy to set up, has fully featured waterproof cameras with night vision, and is an affordable system for home use. For businesses, we recommend the avoiding DVR systems. NVR surveillance systems are much better suited for cases where you want more than 4 cameras, and they’re slightly more convenient to install because they’re powered over ethernet cables. What should you choose between an NVR or DVR security system? As far as recorders are concerned, in general, you don’t only have to consider the price of the equipment but also its wiring. The wiring is one vital factor which sets these two systems apart. If you already installed an analog surveillance system, you can opt to upgrade it with a high definition analog camera incorporating of a 960H/WD1 DVR. The use of the existing coaxial cables for installation of the new analog surveillance system will help cut down the costs and eliminate the need to run a new wiring. The latest analog high definition technologies such as HD-CVI, HD-SDI can also transmit high definition videos over coaxial cable, letting you replace an old equipment to upgrade a traditional system into a high definition surveillance system. Obviously, if you will consider the quality of image, both IP technology and analog high definition surveillance technologies will be able to support HD video surveillance. However, IP technology has the ability to offer a relatively higher resolution which includes 3 megapixel to as much as 5 megapixel resolution. This also comes with a more powerful network function, giving you a better flexibility for an integration solution. The use of PoE or Power over the Ethernet or WiFi will help simplify the whole process of installation of an IP surveillance system. A lot has been written about IP and Megapixel security cameras and this is not a big surprise. After all, they have a remarkable ability of offering valuable evidence to the authorities and vividly clear images to their users. When IP/Megapixel cameras are discussed, storage and recording does not always come up. Most of the time, the subject is more focused on the earlier mentioned level of clarity. With their counterparts, the analog cameras, at least most people already heard of DVR or digital video recorder. As stated earlier, this device can record the footages taken in by the analog security cameras. The VCR or video cassette recorder was also in vogue in years past. However, the good news is that there is no longer a need to fast forward and rewind until your fingers get blistered to find an event that happened a few weeks before. But as times go forward, you will surely hear more about the NVR instead of the VCR. With the network video recorder, the video output will obviously come from the network as the video is already encoded at the cameras. If you are curious to know what encoding is, this is basically the conversion of digital video files from a format to another. Then, the video is streamed to the NVR where it is stored and can be viewed remotely as it is on a network. As for a DVR, the encoding is done at the DVR itself and not at individual cameras. As this can digitally compress the analog feed, this should be found close to the feed. An NVR can also be placed anywhere on a network. There is one notable benefit to this, one of which is the protection against a network failure. In mirroring, an NVR can be placed all over the network to make duplication possible. Access is another remarkable difference between an NVR security system and DVR security system. For viewing recorded videos, you have to be at the DVR or you can also burn the disk if you like to view it somewhere else. On the other hand, with an NVR, because of its nature being part of a network, remote viewing is possible. The last but not the least, pairing a security camera with an NVR is actually much more restrictive compared to doing it with a DVR. That is why you have to be extra careful when you purchase your cameras and ensure that they are compatible before you do so. For more information about NVR and DVR camera systems, we recommend reading our guide to the best home security camera systems, where we have in-depth reviews of both NVR and DVR cameras.